A 9 mil semi-rigid PVC display film with a“low glare” satin finish and an instant dry, scratch resistant coating. The durable construction features tear resistant PVC intended to be used unlaminated to create a durable rollup panel engineered to withstand repeated rolling in portable display units without cupping, warping or scratching. 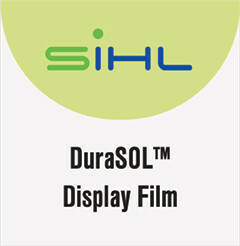 DuraSOL™ Light is compatible with all solvent printers but not recommended for UVC printers. A 12 mil semi-rigid PVC display film with a “low glare” satin finish and an instantdry, scratch resistant coating. The durable construction features tear resistant PVC intended to be used unlaminated to create a durable tradeshow or rollup panel engineered to withstand repeated rolling in portable display units without cupping, warping or scratching. 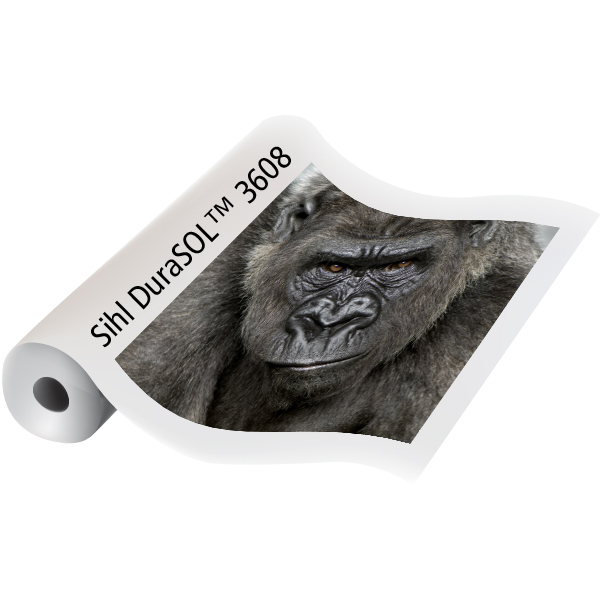 DuraSOL™ Medium and Heavy are compatible with solvent and UVC printers. A 17 mil semi-rigid PVC display film with a “low glare” satin finish and an instant dry, scratch resistant coating. The durable construction features tear resistant PVC intended to be used unlaminated to create a durable tradeshow panel engineered to withstand repeated rolling in portable display units without cupping, warping or scratching.